The 1985 Honda VF700S Sabre cafe racer… she runs! 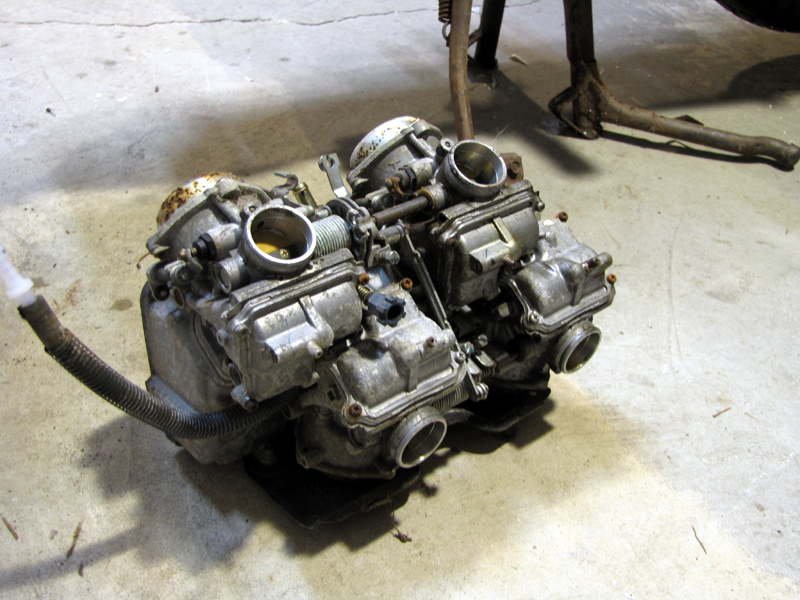 This week was spent on the carburetors. From what I can, this bike sat out in the weather for some time parked on the kick stand. 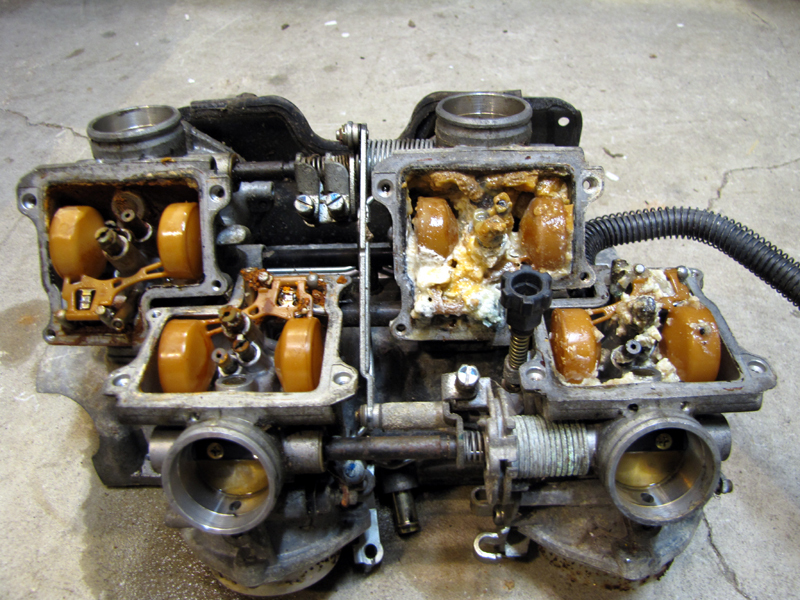 Both of the left side carbs had water in them which caused a strange slime mold to form. After removing the four carbs from the bike as a complete assembly, I put them in a 5 gallon bucket of water with some detergent added. This did a good job of breaking down the yuck! After a good overnight soak, I rinsed them with water and began disassembly. Nearly all of the jets were clogged up but with the help of a small wire I cleared them out. The float bowls were a mess with white powdered aluminum oxide which had to be scraped and brushed away. 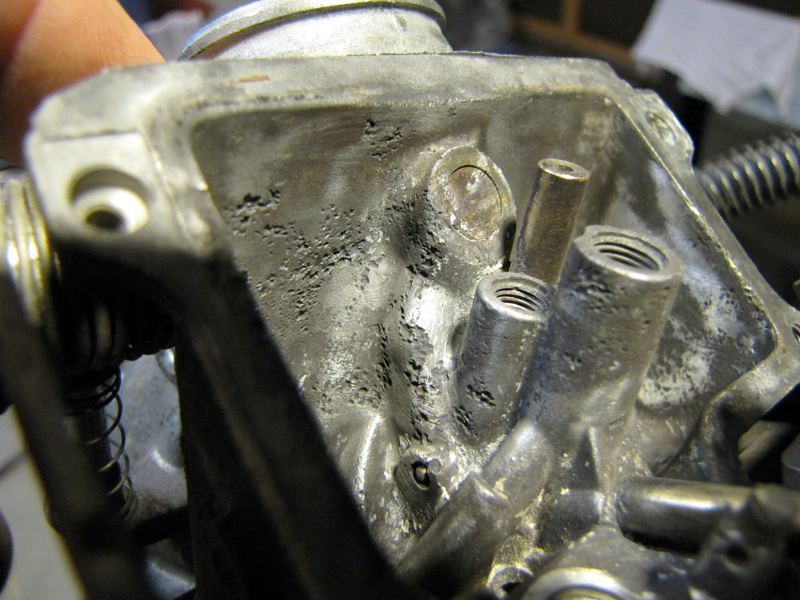 The good news was that the diaphragms at the top of the throttle slides were ok as were the needle and seat valves. Once everything was cleaned up I put them back together and installed them back on the bike. After filling the float bowls with gas I hit the starter button and it reluctantly started, warmed up a bit and took throttle! Awesome! It runs ok and I didn’t have to buy four expensive carb rebuild kits! I made good progress on the seat blank as well. I built a hot wire foam cutter and used two templates shaped like the tank to cut out the blank from the blu foam that I had laminated together. The whole thing is in the video below. It’s 27 minutes long so get comfy and enjoy. One Response to The 1985 Honda VF700S Sabre cafe racer… she runs! oh the hot wire cutter was a good idea, I am gonna have to make one of those this afternoon. Did you save the scraps so that you can re -square the block and hot wire in the other plane?